Pale skinned gals rejoice –find it difficult to get your foundation to match your neck like I do? Is your face a full shade darker than your neck too? 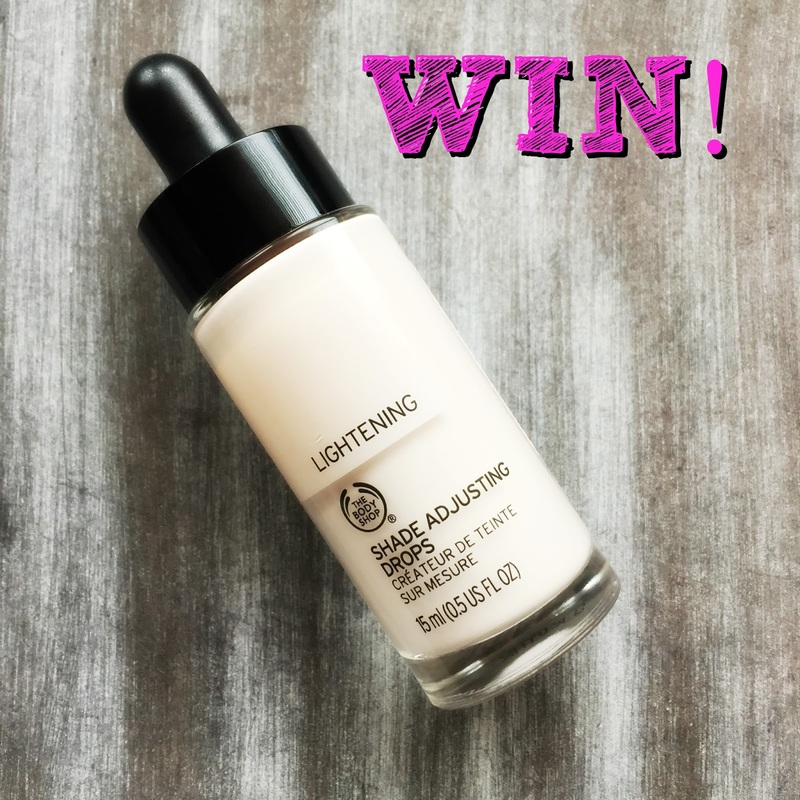 The Body Shop have just launched two swanky new foundation shade adjusting products – lightening drops and darkening drops, to either lighten or darken the shades of your favourite foundations that you already have. The Body Shop are not re-inventing the wheel on this latest release because there are other lightening mediums available but there is most definitely a gap in the market for an affordable and accessible foundation lightening mixing solution. Props to the Body Shop for recognising that there are more than 6 different shades of skintones, particularly as a lot of the drugstore/high street foundations come in a variety of six shades. The shade of the lightening drops is a not a true white but more of a sheeny ivory white leaning a little pink. This will be particularly handy for folks with seeking to lighten foundations that are too yellow based as the pink will serve to neutralise the yellow tones. That said, I’m naturally cool toned and my skin leans a little pink but I did not find that the lightening drops, when applied to my cool toned foundations, made my skin look any pinker. When you are very pale and very cool toned, foundations can be ridiculously pink (Make Up For Ever I’m thinking of you here!) so I promise I would be the first to tell you if these drops would make you look like you dipped your head into a can of baby pink paint! This product retails for €17 and contains 15ml of product which is about half of your standard bottle of foundation. The weighty glass packaging has a pipette dropper on top, perhaps to add to the “mixing” element, but I have found the pipette to be awkward to use. No matter how much I squeeze the top of it, the product just doesn’t get sucked up to be squirted out, and when you do try squirting out, all you seem to get is air bubbles. I personally would have preferred a pump on this to be able to more easily control the quantity of product that comes out. The claim is that one drop of this will lighten your foundation by half a shade but I wouldn’t pay much heed to this claim to be honest because that will completely depend on your skin tone versus the shade of foundation that you are trying to lighten versus the effect you are trying to achieve. The Body Shop claim that this will not change the consistency of your foundation – again, I haven’t found this to be the case. Once the lightening drops are added to your foundation, they definitely change the formula of your foundation slightly, I noticed that it made very full coverage foundations like Estee Lauder Double Wear slightly less full coverage (but gave more slip which made it easier to apply) and it made the MAC Pro Longwear foundation more radiant and sheeny (not greasy!) looking. I’m really not averse to this because I loved how the finished foundation mixture looked and lasted on my skin. I’ve been trying it out for over a month so have compiled my thoughts. Firstly, for how I use it, I take 2 pumps of the foundation I am seeking to lighten (I adore MAC Pro Longwear and I usually take an NW20 in MAC foundations but any MAC foundation wearer will know that an NW20 in one MAC foundation is not the same as the next MAC NW20 foundation…I digress…) and I pump it directly onto a foundation mixing palette (I got this one from the Irish Beauty Show a few years back but the back of your hand will do). I put a couple of lightening drops on the foundation and mix together, then apply directly to my face. There is really no magic or tricks to it and you don’t need a chemistry degree to figure it out. All of my nitpicking and qualms aside, I have to say, I had great success using this product and I really liked how it both lightened my foundation and gave my foundation a different consistency. 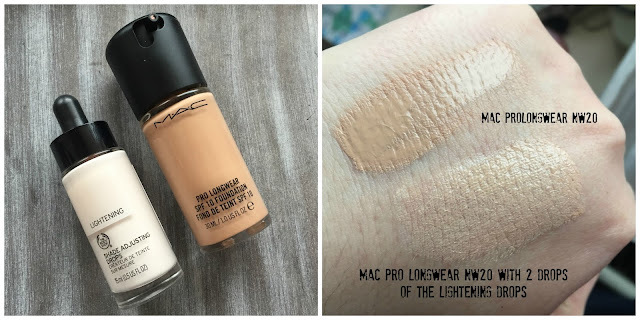 I love MAC Pro Longwear anyway, it lasts brilliantly on my skin, looks flawless and when buffed out, it doesn’t really feel or look heavy or cakey on the skin (unlike its first cousin Studio Fix!). I think the lightening drops added a nice bit of non-glittery luminosity to the foundation, and it applied perfectly to my skin and lasted equally as long as it does normally on my skin. I did not feel like the lightening drops in any way detrimentally affected my foundation in terms of application, wear or appearance. I’m looking forward to trying these out with other foundations going forward. What I really like and rate most about this product is that it will enable me to use some of my favourite foundations all year around, and not just the summer months when I sport a bit of fake tan. In that respect, I think the €17 investment was well worth it. Like I said previously, The Body Shop did not reinvent the wheel with this product, but I like what they’ve done (apart from the dysfunctional packaging) and I can see myself using this loads. Does this product sound like the answer to your prayers or too good to be true? 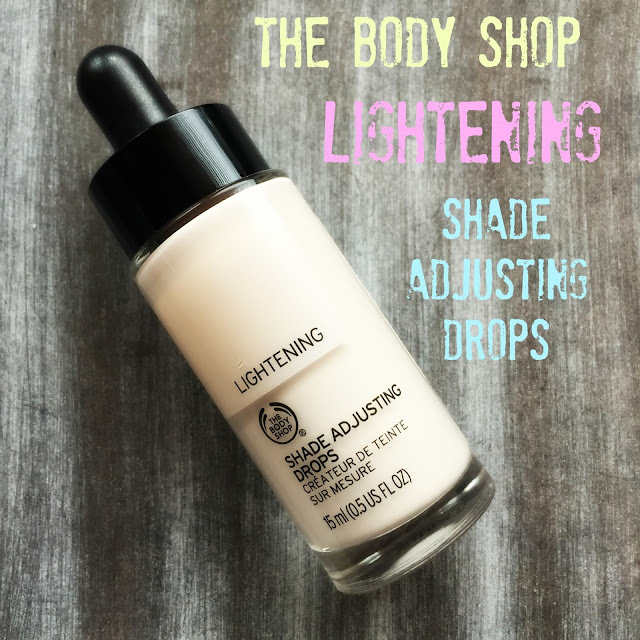 Have any of you tried the darkening shade adjusting drops from The Body Shop? I've been thinking about trying this product. Right now I'm using the Nyx white foundation mixer. I like the Nyx but I need something to use with the foundations I have that are too yellow. Thank you for the review and giveaway! Ohhhhh now this is exactly what I've been looking for. I've a drawer of foundations that are a bit too dark!